Big banks reported 4Q earnings during the week of January 14. 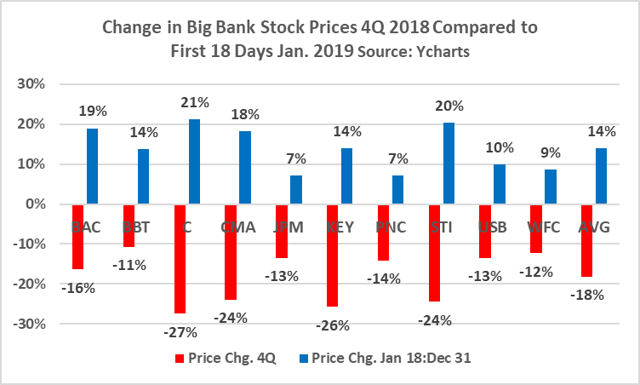 Despite a -18% decline in big bank stock prices in 4Q, the sky is not falling. Credit risk appears well-managed and bank executives appear to have learned valuable lessons coming out of the Financial Crisis. Loan growth is barely tracking with GDP growth, but this may be good news at this point in the business cycle. Now is a good time to own well-managed banks. My chief goal for this post is to offer my view as to the most important facts bank investors must know coming out of earnings calls during the week of January 14, 2019. A secondary goal is to offer several high-level observations about bank risk. Bank investors have been on a wild ride over the past several months. 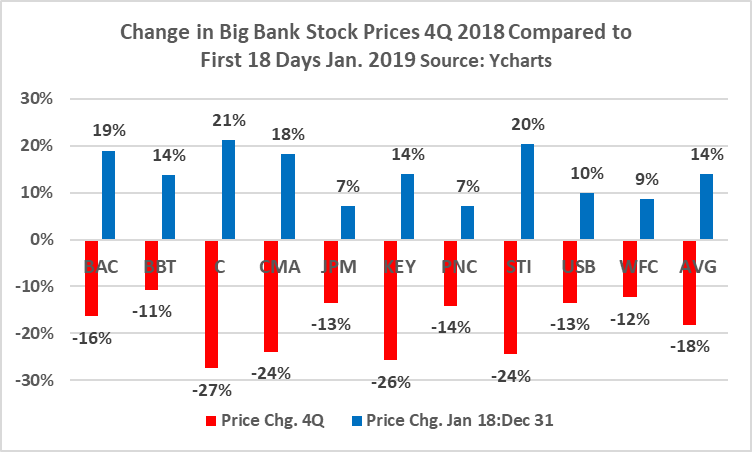 Chart 1 shows that the average big bank saw its stock price decline by -18% during 4Q 2018. In contrast, those same ten banks are up on average +14% from December 31, 2018 to January 18, 2019. Chart 1 triggers three questions. Why did investors go so quickly from seemingly despising bank stocks to embracing them? Were investors wrong to sell bank stocks in 4Q? Are investors wise to be buying and holding bank stocks in January? Going into 4Q 2018, I was keen to read bank earnings call transcripts for the third quarter. At the time I conducted the same kind of analysis that I will show you in this post. Based on my reading of transcripts back in October, it seemed highly probable to me that there was no imminent threat to bank earnings. Two facts stood out from those 3Q 2018 earnings reports and transcripts. First, I knew that credit quality across the banking industry remained excellent. Chart 2 attests to this fact. This chart shows my favorite credit quality metric, Provision for Loan/Lease Losses as a % of Assets, from 1984 through Q3 2018. Encouragingly, the 3Q 2018 Provision/Asset ratio was .27% (annualized). This ratio showed no deterioration in the long-term trend coming out of the Financial Crisis. The second fact I knew was that no CEO expressed grave concern of short-term earnings being in immediate jeopardy. Importantly, over the course of the quarter, no bank issued an earnings warning to investors. This told me that credit quality was likely to remain intact when banks began reporting earnings in January 2019. The absence of either credit or earnings warnings gave me growing confidence that short-term earnings targets were likely to be realized. As a result of my presumed knowledge, when bank stocks started falling hard in late October, I wrote an article for Seeking Alpha posing this question, “Is It Time to Sell Bank Stocks?” In that post I suggested investors hold bank stocks, and if intrepid, acquire shares in their favorite banks. I took my own advice. In November I picked up shares in a Kentucky community bank that I’ve liked for a long time, but felt was too expensive, Stock Yards Bancorp (SYBT). In December I bought more Huntington Bancshares Inc. (HBAN) for reasons cited in my July 28, 2018 Seeking Alpha post. Having recently increased my risk tolerance for bank stocks, I was especially eager to read the earnings call transcripts for the big banks starting with Citi which reported on January 14. My analysis of earnings calls during the week of January 14 centered on ten banks: BB&T Corporation (BBT), Bank of America Corporation (BAC), Citigroup Inc. (C), Comerica Inc. (CMA), JPMorgan Chase & Co. (JPM), KeyCorp (KEY), PNC Financial Services Inc. (PNC), SunTrust Banks Inc. (STI), U.S. Bancorp (USB), and Wells Fargo & Co. (WFC). “Credit quality continues to be a strength"
Maybe this is true about all investments in public companies, but I believe investors in banks should be especially mindful of the comments bank executives make during earning calls as well as in annual reports. How important is the business cycle to banks? Consider this fact: “Cycle” was referenced 22 times in the JPM call, 15 times WFC, and 9 times each at BAC and STI. No big bank executive did a better job focusing on the business cycle in 2005-07 than Jamie Dimon. Go back and read his letters to shareholders at that time for evidence. Coming out of the Financial Crisis nearly all bank risk executives have come to recognize the importance of the business cycle in managing emerging risk. If you want a sense of what JPM thinks about the business cycle today, here are excerpts from comments made by their CFO, Marianne Lake, on January 15. “CRE loans were up 2%, also below the industry as we proactively slowed our growth due to where we are in the cycle, through continued structural and pricing discipline and targeted selections as we build. Underlying credit performance remains strong. So, I would say, first of all just to say that the question mark about whether that’s a pause or a stop; is it the end of the cycle, we don’t think so. We think the outlook for growth and the economy is still strong; the consumer is still strong and healthy; and we are expecting to still see maybe slower but still global growth going forward. That final comment is especially illuminating. It highlights that the U.S. is not at the end of the business cycle based on our understanding of business cycles historically. Lake is also leaving open the possibility that the U.S. is nearing the end of the cycle. If true, she says, this cycle is behaving differently than past ones. Note also that JPM has tempered its appetite for commercial real estate lending. This is telling since CRE loans historically tend to be one of the most volatile asset classes for banks over the course of the business cycle. JPM is not alone in closely monitoring the business cycle. Other bank executives talked on recent earnings calls about “through-the-cycle” risk and returns. If you want to read an especially insightful discussion about through-the-cycle risk, check out the comments made by Bill Rogers of STI. Here is one of those comments made on January 18. Bill Demchak of PNC rarely lets an earnings call go by without emphasizing the link between managing “through-the-cycle” and long-term returns. Here’s what he said on January 16. Returning to Chart 2, note that the word “risk” appeared 136 times during the ten earnings calls. Perhaps no surprise given its colossal risk governance failures, “risk” was mentioned 35 times at WFC. Check out this “risk” comment made January 15 by Tim Sloan of WFC. While I have been a critic of WFC’s risk governance failures (notably Operational and Compliance), I also want to emphasize that WFC (that is, Norwest, which acquired Wells) has a 30-year track record of strong credit risk management. The final word I looked for in 4Q earnings call was the word “discipline.” The reason I like this word is based on interviews I conducted with CEOs of banks that did particularly well through the last cycle. In my interviews I learned that several of these CEOs ascribed their banks’ success from 2008-10 to an unswerving commitment to consistent and rigorous loan underwriting discipline. These CEOs tend to be “by the book” lenders who never compromise fact-based underwriting standards. Notice that the word “discipline” was mentioned ten times at JPM. 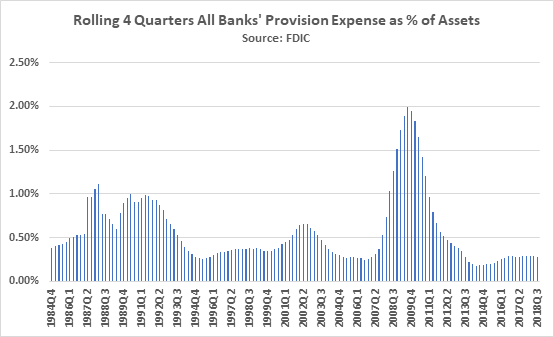 To determine if bankers are talking the talk but not walking the talk, I examine the balance sheets and income statements of select banks as well as the industry (data from FDIC) to identify factors that could destabilize the banking industry and create systemic risk. There is no factor more important to monitor than loan growth. The change in the velocity and volume of loans is highly correlated to bank risk. Based on my research, bank loans have grown over time at an average rate of 1.5 to 1.7 times faster than (nominal) GDP. However, this growth has been anything but smooth and steady. It tends to rise most dramatically over the baseline when bankers are most confident. Conversely, it falls well below the baseline when bankers are recovering from irrational over-confidence. In the years leading up to the Financial Crisis, loans grew 5+ times faster than GDP. This led to a violent reversion to the mean. Total loans in U.S. banks, according to the FDIC, peaked in Q2 2008 and then fell 10%. It took six years for U.S. banks to get back to the 2008 peak. In January 2019 there is no evidence of irrational loan growth. Chart 3 shows that loan growth for big U.S. banks is barely keeping pace with GDP growth. In 2018 loans grew a paltry 2.5% in an economy that likely grew 3%+. In 2017 loans grew 2.9%, but that number is inflated by the transfer of the Costco credit card portfolio from American Express to Citibank. There are two ways to look at the current loan growth rates at big banks. The cup-half-full view is my view. I like the fact that loan growth is running roughly in line with GDP growth. This tells me that the industry remains disciplined. 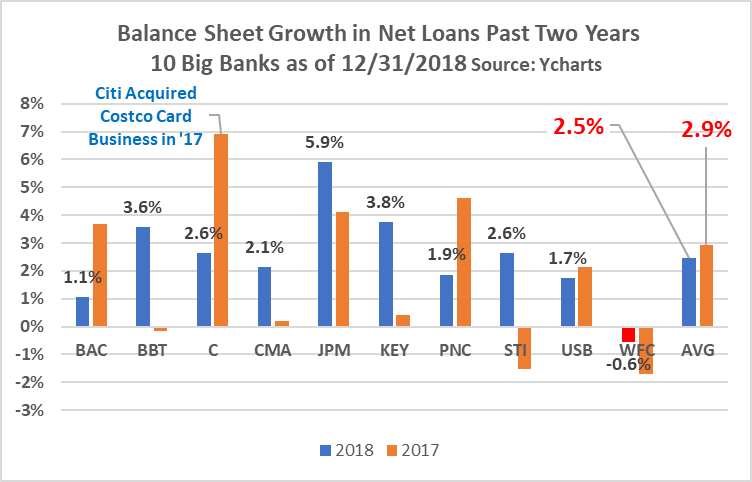 The glass-half-empty view is that bank balance sheet growth is anemic, and therefore, there is little potential over the next year for big growth in bank earnings. I am comfortable trading off high growth—which I know from experience is unsustainable—for slow and steady growth. Like Aesop's turtle, slow and steady wins the race for long-term buy-and-hold bank investors. Here is another consideration as investors weigh bank risk and return. Do not forget that big banks (and some smaller ones) are currently buying back a massive number of shares. The good news in 2018-19 is that those shares are being bought back at modest P/Es compared to the buybacks conducted in 2004-07. In PNC’s 4Q 2018 earnings call, CEO Demchak said that the bank has reduced share count by 14% in recent years. PNC is not the only bank to witness double-digit decline in share count. The combination of slow and steady earnings growth with share buybacks and decent dividend yields suggest that the total return for bank stocks over the near future has the potential to match the 10% annual total returns averaged by big banks over the past 30 years. When markets act irrationally as we saw in February 2016, late June 2016, and 4Q 2018. When bank insiders buy, particularly if it is a leading bank CEO (or a long-time CFO) with a proven history of prudent leadership and commitment to long-term share ownership. The time to sell bank stocks is when bank growth outpaces the growth of the real economy. History tells investors that it is easy for a bank to grow fast. In almost all cases, the fast growth is tied to an aggressive risk appetite that is producing low-quality earnings. In January 2019, bank executives seem to be saying and doing the right things. Bank EPS seems to be growing at the right pace. Now is a reasonable time to own good banks. Emerging risks that could disrupt earnings in a material way have not yet appeared. One final thought. While this post did not address interest rate risk (the reason is because big banks try to position their balance sheet to be interest rate neutral, a theme mentioned by STI's Rogers during his call), interest rates can present material risk to bank earnings. Like what JPM's Lake had to say about the current business cycle, today bank risk executives and directors are confronted by many unknowns associated with interest rate risk. The most salient of those unknowns is the potential for ballooning federal government debt and deficits to impact future bank earnings. In the short-term, there is no reason to believe interest rate risk is not manageable for the big banks. Longer-term, however, there are many unknowns. Investors can best manage this risk through prudent asset allocation. Disclosure: I am/we are long JPM, PNC, LKFN, HBAN, TCBI, SYBT, PACW. I wrote this article myself, and it expresses my own opinions. I am not receiving compensation for it (other than from Seeking Alpha). I have no business relationship with any company whose stock is mentioned in this article. Additional disclosure: Though not owning BAC shares, as a retired Bank of America employee, I have other financial interests in the bank.